Anyone who suggests that Jim Prentice can govern Alberta with Peter Lougheed's "legendary thoughtfulness, tone and command" demonstrates an appalling lack of understanding of all that Premier Lougheed achieved in the 14 years he governed this province. They ought to be ashamed of themselves. Susan Wright Lawyer, writer and political activist. It's official. 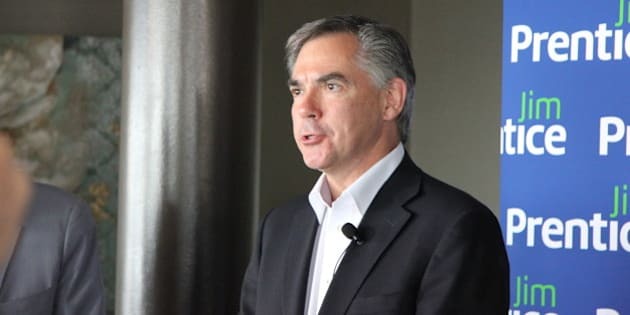 As far as Ms Corbella is concerned Jim Prentice is the answer our prayers--the leader for those of us who "pine for the days of Peter Lougheed and all that he embodied". This statement is so fatuous that Ms. Soapbox is compelled to respond with her own Top Ten List: Reasons Why Jim Prentice is Nothing like Peter Lougheed. Unlike David Letterman's lists, this list is funny only if you ignore where we'll end up if Jim Prentice and the PCs are re-elected in 2016. 10. Lougheed galvanized all Albertans in a fight with the feds over ownership of provincial resources. Prentice is whipping up one faction of conservative Albertans against another faction of conservative Albertans and the rest of us be damned. 9. When it comes to dealing with Big Oil, Lougheed was G.I. Joe. Prentice is a Care Bear. The US State Department described Lougheed as "arrogant and belligerent, particularly if he encounters opposition from...oil company executives." The Financial Post describes Prentice as "Big Oil's Kindred Spirit." 8. Lougheed believed that Alberta's natural resources belong to the people and wanted to see an increase in oilsands royalties. Prentice acts like our natural resources belong to the oil companies and refuses to increase royalties under any circumstances. 7. Lougheed wanted an increase in personal and corporate taxes in order to balance our strong economic performance with our weaker social and environmental performance. Prentice's response? Read my lips, no new taxes. 6. Lougheed worried that the Alberta government let oilsands development get ahead of infrastructure and was paying the price in crumbling highways and crowded schools and hospitals. Prentice says damn the torpedoes, full steam ahead because there might be a "price correction" (read: oil price drop) as early as 2017 that will hit the oil producers right in the balance sheet. 5. Lougheed called Fort McMurray and the tar sands a "moonscape" and a "mess". He urged the government to revise its policies. Prentice pays lip service to finding the "right balance between resource extraction and the environment", but concludes that "we're actually very good at that." 4. Lougheed said "no" to Keystone XL and "yes" to value-added upgrading in Alberta. Prentice said the exact opposite. 3. Lougheed was a fiscal conservative who believed that government had a role in encouraging industry to act for the greater good of all Albertans. He believed that natural resources should be managed with good public policy and created the Alberta Energy Company and Alberta's petrochemical industry as vehicles for job creation and economic growth. What is Prentice's view on the government's role vis-a-vis industry? Let me guess...If Big Oil is happy the rest will take care of itself. 2. Lougheed was a visionary leader with an eye to the future. He inspired Albertans who suffered through drought, depression and war to move into the mainstream of Confederation. Prentice is yesterday's man. He personifies the status quo--a stagnant 43 year old government responding to the demands of Big Oil with no inkling of how to address the challenges of the 21st century. 1. In 2006 Peter Lougheed was asked what challenges would face the next premier of Alberta. He said there would be many, but "...on the economic side it will be trying to manage the development of the Alberta oilsands." Prentice will turn management of the oilsands over to Big Oil because that's what kindred spirits do.